Then came Christmas time and all of the craziness of trying to get presents finished. 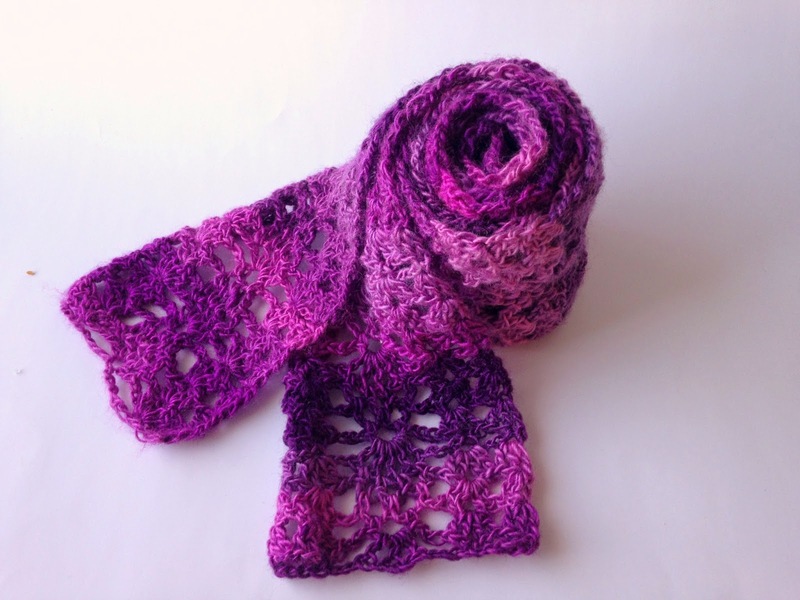 I didn't really have any time to make a scarf just to try out a pattern and a yarn. So, the idea got pushed back, the library book returned and the yarn was never bought. For Christmas I was given a couple of gift cards and when I went to look for the things that I wanted to buy I decided that one of the things I really wanted was a crochet stitch dictionary. I love looking at different stitches, every time I look through one of those books I feel like my mind is overflowing with new ideas of how to use each stitch in a new way. I found Crochet Stitch Dictionary and decided to buy it. I was so excited the day that it came in the mail. I looked through it, thinking of all of the things that I could make using each different stitch. 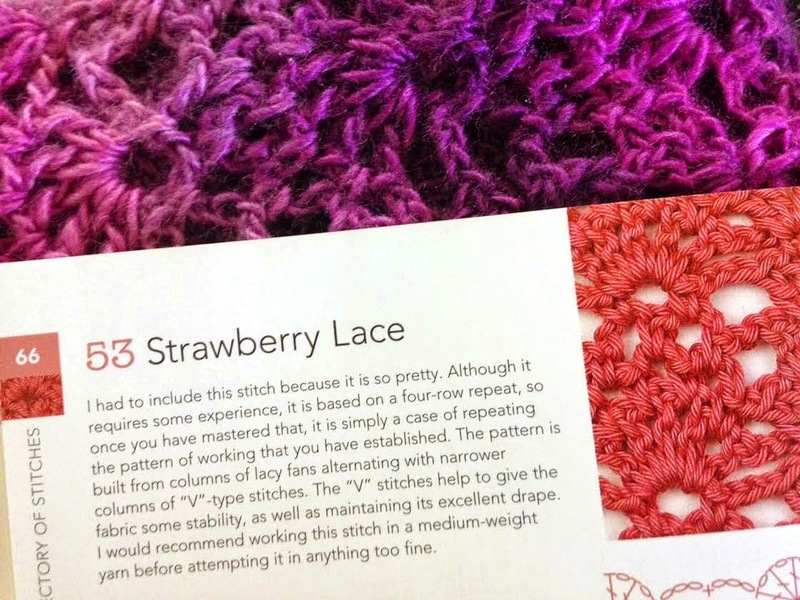 One of the stitches in the book was called Strawberry Lace and when I looked at it I realized that it was the exact same stitch as Blackberry Jam in the other book. I decided it was time to try out the idea I had had to make a scarf using this stitch. I bought the yarn that I wanted to try and then I played around with it a little bit to get what I wanted. The stitch repeat is really big so my first attempt ended up really wide. I'm sure it would be really nice for some things but it wasn't what I was envisioning so I tried again and this pattern is what I came up with. 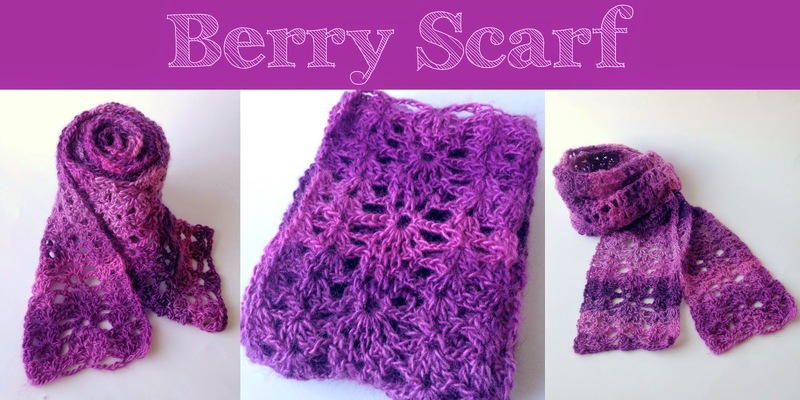 I think the stitch looks more like blackberries than strawberries but since I found the pattern under both names I just called it the Berry Scarf. 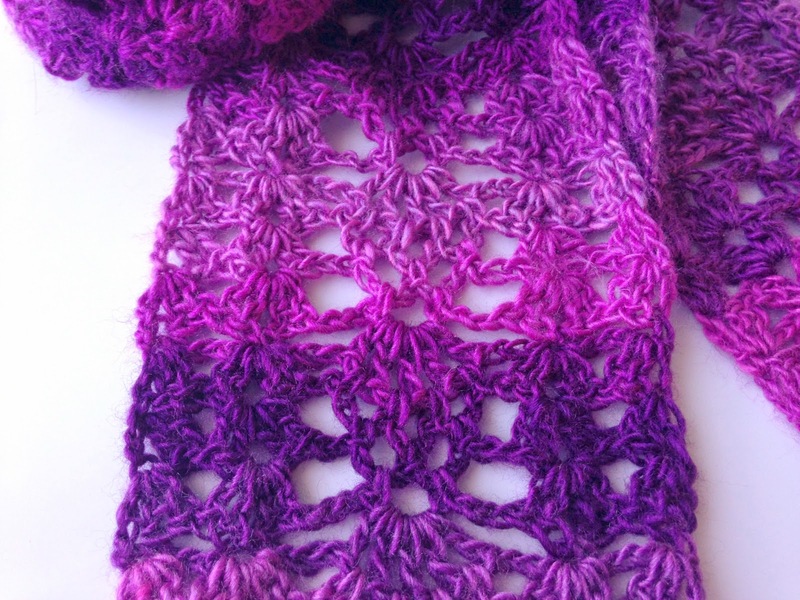 It was fun to see all of the different shades of purple appear as I worked on the scarf. I had heard nice things about this yarn so I was excited to try it. I liked working with it. I think this is the first time I have worked with a yarn with longer runs of color. Most multicolored yarns I have used are the variegated yarns with short color runs and I never like the way they look when the colors clump together. I think the seeing the different colors was my favorite part of working with this yarn. 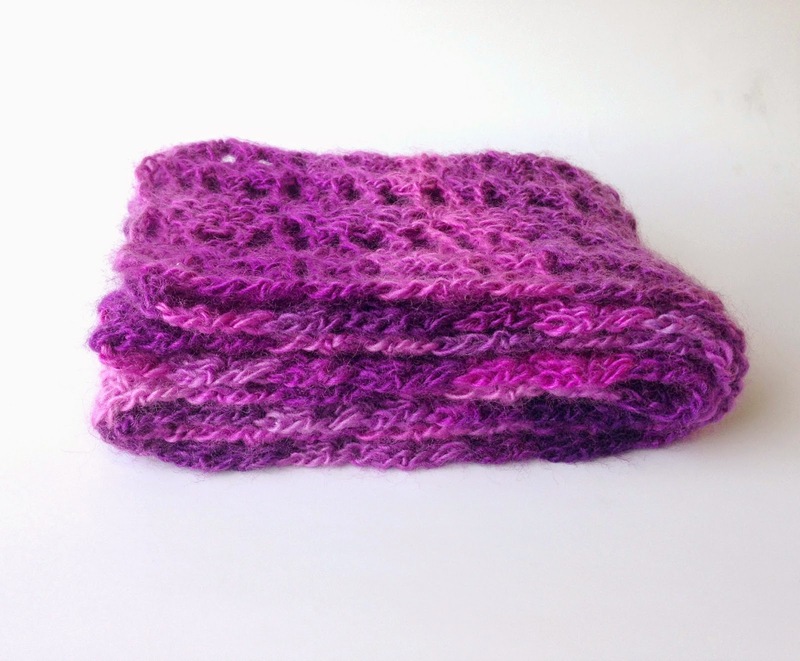 My finished scarf was approximately 6 inches wide and 72 inches long. Repeat rows 2-5 until scarf is about as long as you want it, ending with row 4. Finish with final row. The last row should straighten out then end of the scarf. Now you are done, it is probably a good idea to block this scarf since it has a lacy pattern and blocking will help open it up. I tried blocking mine but I don't think I did a very good job. I have only tried blocking things a few times so I don't know if I did it right or if the yarn just didn't block well. I have heard mixed reviews about the ability to block acrylic yarn so that may have been the problem. 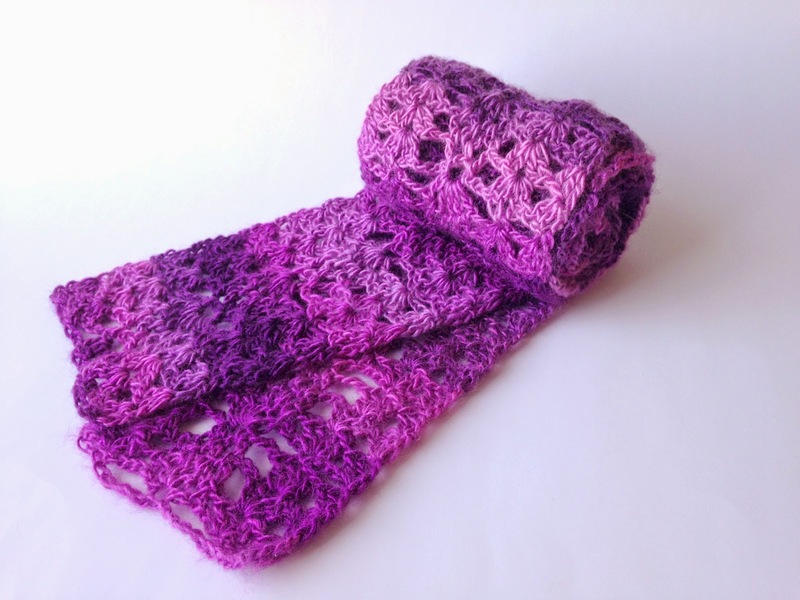 I hope you enjoy this pattern and your new scarf. If there is anything that seems confusing or if you have any questions feel free to contact me and I will try to help clarify. I don't have a problem with people selling things that they make using my patterns. 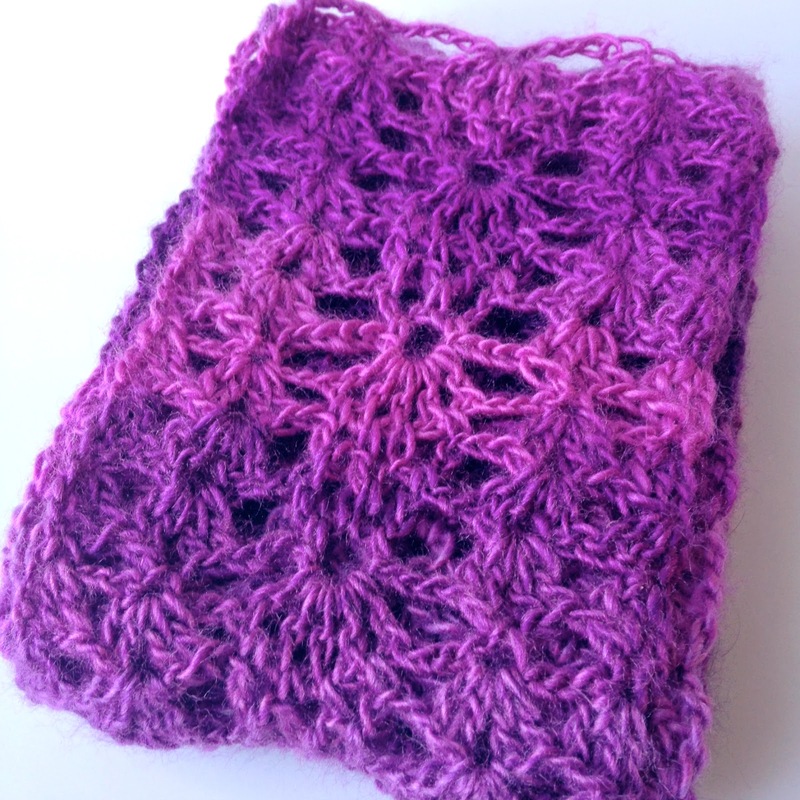 A mention of my blog would be appreciated so that people can know where you found the pattern. Sorry it has taken me so long to get back to you, everyone in my house has been sick. You are right, I completely left that part out, I will edit it right now so that it is right. Thanks for catching that. 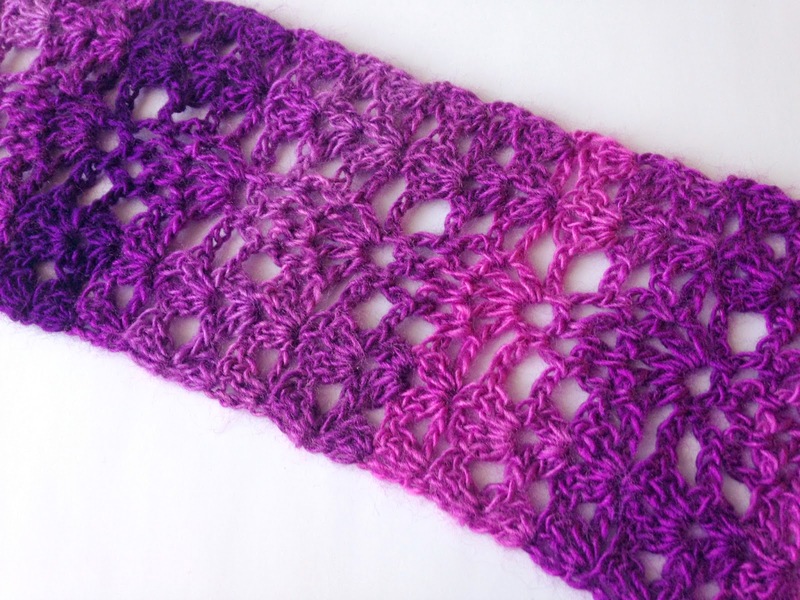 Thanks so much for sharing this beautiful pattern. 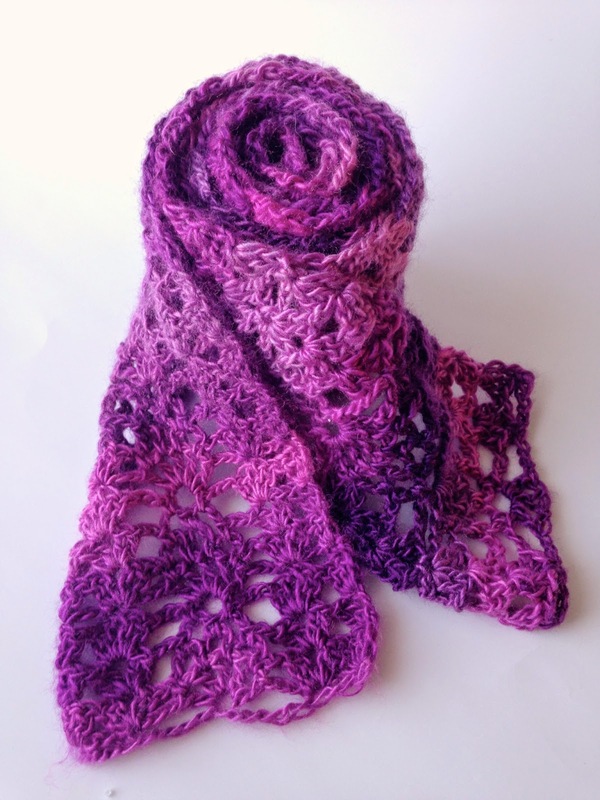 I love the "Petunia" colorway too & think it's perfect for scarves! 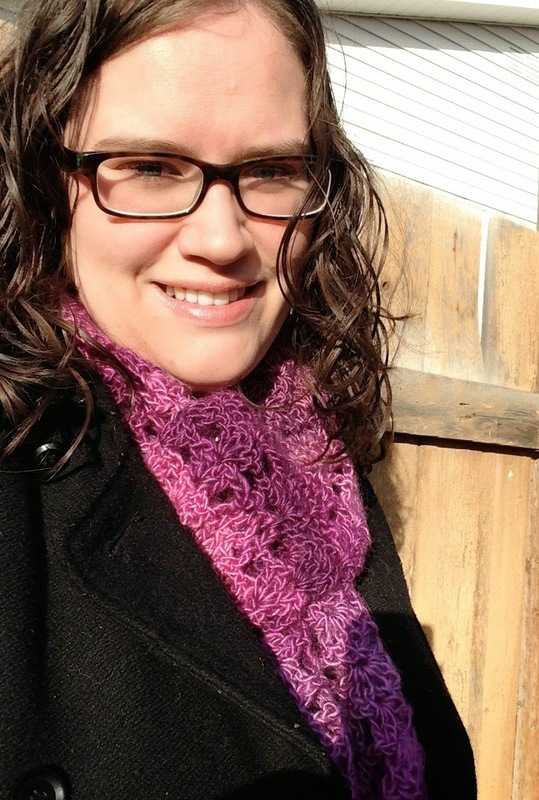 Beautiful scarf, Erica! I absolutely love the pattern and color! 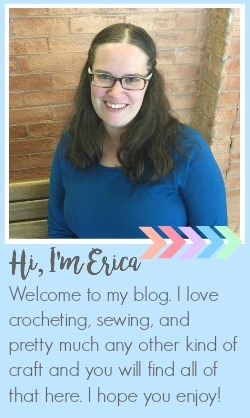 Thank you for sharing pattern! Beautiful!! You should send this post to Tangled Happy. Lovely! Thanks so much for sharing. Now I know how to put my Mother's Day yarn to good use. :) Could you please tell me, what is the pattern repeat should I wish to make it wider? Thanks again. Linda in Ontario, Canada.